Delivery Value System (DVS) completed a major data re-collection and database expansion in the Fall of 2018. This increased the number of professional and college pitchers in our database to over 1200, including every MLB pitcher on an opening day 2018 roster. Our database includes full injury histories, mechanical profiles, biographical information, and inning histories for these pitchers. The DVS mechanical scoring system is a proprietary component of the DVS Model that is used to quantify the efficiency within any pitcher’s delivery. The total DVS Score is a simple sum of the different sub-component scores of the DVS mechanical scoring system, with higher scores being better than lower scores. A major throwing-related injury is defined as an arm surgery or an arm injury that requires at least a 90-day absence from competitive throwing. With this most recent data update, the DVS Model continues to find that pitching mechanics, as measured by the total DVS Score, is statistically related to the risk of a major throwing-related injury. The DVS Model includes other variables beside just pitching mechanical profile, but mechanical profile alone provides a statistically significant improvement in model predictive ability over a model without any model variables (p-value < 0.001). In addition, the full DVS Model shows that there is a 7.4% drop in major injury risk at any given pitch with every incremental improvement in a pitcher’s total DVS Score. The relationship between predicted risk of major throwing-related injury from the model and the total DVS Score is displayed in the two plots below. The plots show predictions for a range of total DVS Scores from the DVS Model for a hypothetical typical young MLB starter, one born in 1995 with no history of major throwing-related injury and about 400 innings pitched in his career (think: the late Jose Fernandez at the time of his 2014 Tommy John surgery). 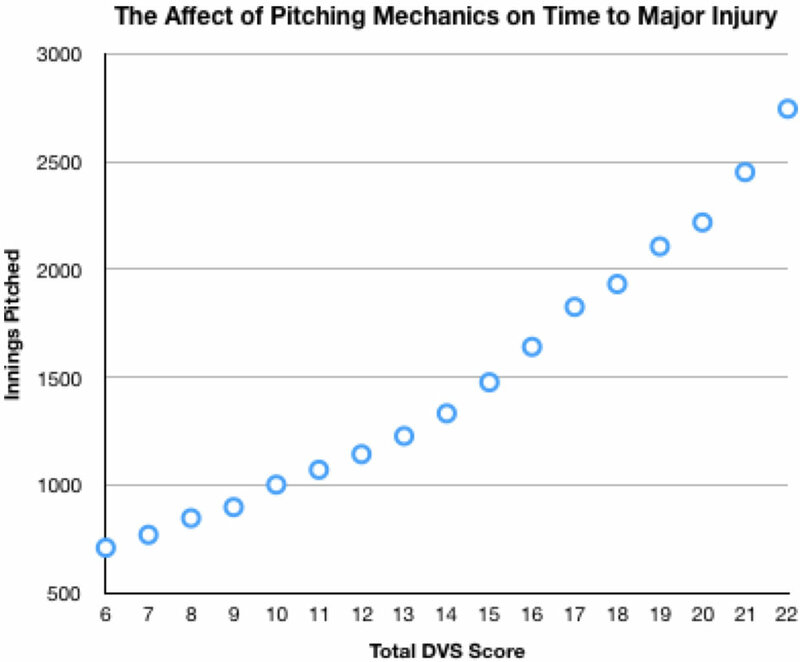 The DVS Model predicts that the hypothetical pitcher has a 50% chance that a major throwing-related injury will occur on or before the number of innings displayed in the first plot - at varying levels of the total DVS Score. Overall, this means that better pitching mechanics, as measured by the total DVS Score, lead to a pitcher being able to throw more innings with the same level of injury risk. In the aggregate, this shows that pitchers with better mechanics will throw more innings on average before their first major throwing-related injury. We see that the hypothetical pitcher with a total DVS Score of 10 is predicted to have a 50% chance of a major injury sometime in the next 1004 innings, whereas that same pitcher with a total DVS Score of 17 has that same 50% chance but sometime in the next 1827 innings. 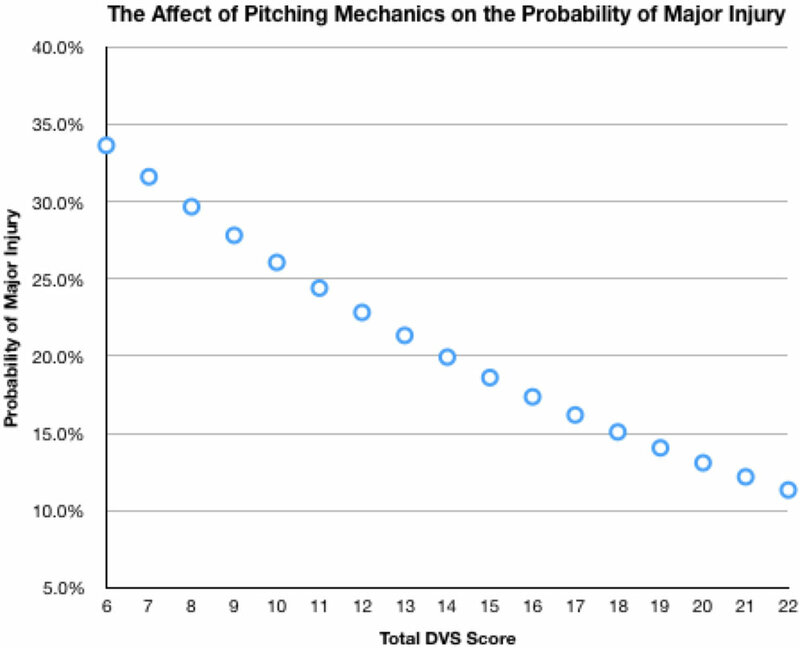 The DVS Model predicts that the hypothetical pitcher has the probability displayed in the second plot having a major throwing-related injury sometime in the next 400 innings pitched - at varying levels of the total DVS Score. Overall, this means that better pitching mechanics, as measured by the total DVS Score, lead to a pitcher being able to throw the same number of innings with less major injury risk. In the aggregate, this shows that pitchers with better mechanics will have a lower risk of their first major throwing-related injury sometime in the next future period of time. We see that the hypothetical pitcher with a total DVS Score of 10 is predicted to have a 26.1% chance of a major injury sometime in the next 400 innings, but that same pitcher with a total DVS Score of 17 has a 16.2% chance of a major injury in that same period of time.